Argentina captain, Lionel Messi is set to miss his country’s second successive international friendly match after it was reported he would not feature in the Albiceleste’s clash with Spain at Atletico Madrid’s Wanda Metropolitano on Tuesday. The Mirror, UK, reports that Messi has been struggling for fitness since linking up with his international side before sitting as an unused substitute during Friday’s 2-0 friendly win against Italy at the Etihad Stadium in Manchester. 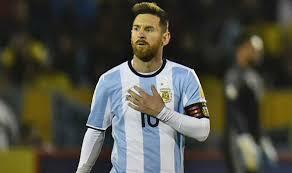 Recall that the Barcelona star did not play for Argentina againt Italy in the international friendly match on Friday. The report added that the 30-year-old has been complaining of discomfort in his hamstring and adductor in his right leg which has been attributed to fatigue from his gruelling season. The forward stayed in the hotel gym on Saturday, but did appear today (Sunday) and went through his paces with the rest of the squad. Messi has played 47 times for club and country since the beginning of the season. “I always feel like playing but there is a long way to the World Cup,” Messi said after missing the 2-0 victory over Italy. “I always want to play, but I came here with discomfort,” he added.